Just a short little video clip today of couple of Boston Dynamics robots (SpotMini models). One of the robots has a mounted robotic arm and opens a door for the other. 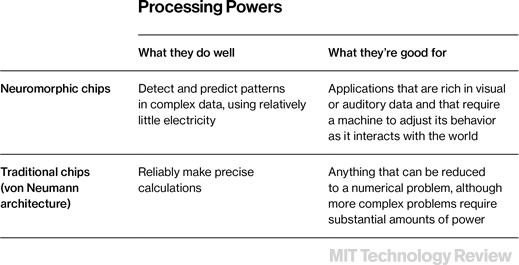 This is another article by Robert D. Hof from the MIT Technology Review website and is about how neuromorphic computer chips (modeled on the biological brains) could make computers “aware” of what is going on around them. This is the kind of technology that we are going to see everywhere. The practical applications are endless. An alternative design for computer chips that will enhance ­artificial intelligence. Traditional chips are reaching fundamental performance limits. A pug-size robot named pioneer slowly rolls up to the Captain America action figure on the carpet. They’re facing off inside a rough model of a child’s bedroom that the wireless-chip maker Qualcomm has set up in a trailer. The robot pauses, almost as if it is evaluating the situation, and then corrals the figure with a snowplow-like implement mounted in front, turns around, and pushes it toward three squat pillars representing toy bins. Qualcomm senior engineer Ilwoo Chang sweeps both arms toward the pillar where the toy should be deposited. Pioneer spots that gesture with its camera and dutifully complies. Then it rolls back and spies another action figure, Spider-Man. This time Pioneer beelines for the toy, ignoring a chessboard nearby, and delivers it to the same pillar with no human guidance. This demonstration at Qualcomm’s headquarters in San Diego looks modest, but it’s a glimpse of the future of computing. The robot is performing tasks that have typically needed powerful, specially programmed computers that use far more electricity. Powered by only a smartphone chip with specialized software, Pioneer can recognize objects it hasn’t seen before, sort them by their similarity to related objects, and navigate the room to deliver them to the right location—not because of laborious programming but merely by being shown once where they should go. The robot can do all that because it is simulating, albeit in a very limited fashion, the way a brain works. Later this year, Qualcomm will begin to reveal how the technology can be embedded into the silicon chips that power every manner of electronic device. These “neuromorphic” chips—so named because they are modeled on biological brains—will be designed to process sensory data such as images and sound and to respond to changes in that data in ways not specifically programmed. They promise to accelerate decades of fitful progress in artificial intelligence and lead to machines that are able to understand and interact with the world in humanlike ways. Medical sensors and devices could track individuals’ vital signs and response to treatments over time, learning to adjust dosages or even catch problems early. Your smartphone could learn to anticipate what you want next, such as background on someone you’re about to meet or an alert that it’s time to leave for your next meeting. Those self-driving cars Google is experimenting with might not need your help at all, and more adept Roombas wouldn’t get stuck under your couch. “We’re blurring the boundary between silicon and biological systems,” says Qualcomm’s chief technology officer, Matthew Grob. Qualcomm’s chips won’t become available until next year at the earliest; the company will spend 2014 signing up researchers to try out the technology. But if it delivers, the project—known as the Zeroth program—would be the first large-scale commercial platform for neuromorphic computing. That’s on top of promising efforts at universities and at corporate labs such as IBM Research and HRL Laboratories, which have each developed neuromorphic chips under a $100 million project for the Defense Advanced Research Projects Agency. Likewise, the Human Brain Project in Europe is spending roughly 100 million euros on neuromorphic projects, including efforts at Heidelberg University and the University of Manchester. Another group in Germany recently reported using a neuromorphic chip and software modeled on insects’ odor-processing systems to recognize plant species by their flowers. Today’s computers all use the so-called von Neumann architecture, which shuttles data back and forth between a central processor and memory chips in linear sequences of calculations. That method is great for crunching numbers and executing precisely written programs, but not for processing images or sound and making sense of it all. It’s telling that in 2012, when Google demonstrated artificial-­intelligence software that learned to recognize cats in videos without being told what a cat was, it needed 16,000 processors to pull it off. Continuing to improve the performance of such processors requires their manufacturers to pack in ever more, ever faster transistors, silicon memory caches, and data pathways, but the sheer heat generated by all those components is limiting how fast chips can be operated, especially in power-stingy mobile devices. That could halt progress toward devices that effectively process images, sound, and other sensory information and then apply it to tasks such as face recognition and robot or vehicle navigation. No one is more acutely interested in getting around those physical challenges than Qualcomm, maker of wireless chips used in many phones and tablets. Increasingly, users of mobile devices are demanding more from these machines. But today’s personal-assistant services, such as Apple’s Siri and Google Now, are limited because they must call out to the cloud for more powerful computers to answer or anticipate queries. “We’re running up against walls,” says Jeff Gehlhaar, the Qualcomm vice president of technology who heads the Zeroth engineering team. Neuromorphic chips attempt to model in silicon the massively parallel way the brain processes information as billions of neurons and trillions of synapses respond to sensory inputs such as visual and auditory stimuli. Those neurons also change how they connect with each other in response to changing images, sounds, and the like. That is the process we call learning. The chips, which incorporate brain-inspired models called neural networks, do the same. That’s why Qualcomm’s robot—even though for now it’s merely running software that simulates a neuromorphic chip—can put Spider-Man in the same location as Captain America without having seen Spider-Man before. Qualcomm could add a “neural processing unit” to mobile-phone chips to handle sensory data and tasks such as image recognition. The idea of neuromorphic chips dates back decades. Carver Mead, the Caltech professor emeritus who is a legend in integrated-circuit design, coined the term in a 1990 paper, describing how analog chips—those that vary in their output, like real-world phenomena, in contrast to the binary, on-or-off nature of digital chips—could mimic the electrical activity of neurons and synapses in the brain. But he struggled to find ways to reliably build his analog chip designs. Only one arguably neuromorphic processor, a noise suppression chip made by Audience, has sold in the hundreds of millions. The chip, which is based on the human cochlea, has been used in phones from Apple, Samsung, and others. As a commercial company, Qualcomm has opted for pragmatism over sheer performance in its design. That means the neuromorphic chips it’s developing are still digital chips, which are more predictable and easier to manufacture than analog ones. And instead of modeling the chips as closely as possible on actual brain biology, Qualcomm’s project emulates aspects of the brain’s behavior. For instance, the chips encode and transmit data in a way that mimics the electrical spikes generated in the brain as it responds to sensory information. “Even with this digital representation, we can reproduce a huge range of behaviors we see in biology,” says M. Anthony Lewis, the project engineer for Zeroth. The chips would fit neatly into the existing business of Qualcomm, which dominates the market for mobile-phone chips but has seen revenue growth slow. Its Snapdragon mobile-phone chips include components such as graphics processing units; Qualcomm could add a “neural processing unit” to the chips to handle sensory data and tasks such as image recognition and robot navigation. And given that Qualcomm has a highly profitable business of licensing technologies to other companies, it would be in a position to sell the rights to use algorithms that run on neuromorphic chips. That could lead to sensor chips for vision, motion control, and other applications. Matthew Grob was startled, then annoyed, when he heard the theme to Sanford and Son start playing in the middle of a recent meeting. It turns out that on a recent trip to Spain, he had set his smartphone to issue a reminder using the tune as an alarm, and the phone thought it was time to play it again. That’s just one small example of how far our personal devices are from being intelligent. Grob dreams of a future when instead of monkeying with the settings of his misbehaving phone, as he did that day, all he would have to do is bark, “Don’t do that!” Then the phone might learn that it should switch off the alarm when he’s in a new time zone. Qualcomm is especially interested in the possibility that neuromorphic chips could transform smartphones and other mobile devices into cognitive companions that pay attention to your actions and surroundings and learn your habits over time. “If you and your device can perceive the environment in the same way, your device will be better able to understand your intentions and anticipate your needs,” says Samir Kumar, a business development director at Qualcomm’s research lab. Pressed for examples, Kumar ticks off a litany: If you tag your dog in a photo, your phone’s camera would recognize the pet in every subsequent photo. At a soccer game, you could tell the phone to snap a photo only when your child is near the goal. At bedtime, it would know without your telling it to send calls to voice mail. In short, says Grob, your smartphone would have a digital sixth sense. Qualcomm executives are reluctant to embark on too many flights of fancy before their chip is even available. But neuromorphic researchers elsewhere don’t mind speculating. According to ­Dharmendra Modha, a top IBM researcher in San Jose, such chips might lead to glasses for the blind that use visual and auditory sensors to recognize objects and provide audio cues; health-care systems that monitor vital signs, provide early warnings of potential problems, and suggest ways to individualize treatments; and computers that draw on wind patterns, tides, and other indicators to predict tsunamis more accurately. At HRL this summer, principal research scientist Narayan Srinivasa plans to test a neuromorphic chip in a bird-size device from AeroVironment that will be flown around a couple of rooms. It will take in data from cameras and other sensors so it can remember which room it’s in and learn to navigate that space more adeptly, which could lead to more capable drones. It will take programmers time to figure out the best way to exploit the hardware. “It’s not too early for hardware companies to do research,” says Dileep George, cofounder of the artificial-­intelligence startup Vicarious. “The commercial products could take a while.” Qualcomm executives don’t disagree. But they’re betting that the technology they expect to launch this year will bring those products a lot closer to reality. This video – Humans Need Not Apply – explores the future of robotics and artificial intelligence and the impact of advancing technology on our economy. The video features Baxter, the robot from Rethink Robotics. Very interesting!